Police are appealing for information on missing school girl Flora Crawford (Uncredited) who is missing without a trace. Thirteen year old Tamara (Stannage) lives with her grandmother Mrs Naughton (Eva Von Mitzka, Narcissists) who doesn’t relish looking after a slouch of a girl and constantly reminds Tamara about what she should be doing next, which Tamara sarcastically comments on in a voice over. 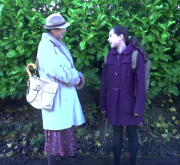 With a horrid day ahead, Tamara trudges off school, where she meets a friend of her granny, Mrs. Cole (Kat-Anne Rogers, Olive Green) who wants to pop round for a cup of tea. After school she has to have a piano lesson at Miss Harrison’s (Sharon Irvine) house. This is another thing she dreads, as Miss Harrison is far more interested in the child protege Alice (Twinkle MacInnes, Mockingbird (Short)). It is when Tamara leaves Miss Harrison’s home that she first notices the dark figure (Chris White) similar to the one the police were warning of. What has this shadowy figure got on his mind? Nicola Irvine has done a cracking job on her first short, taking on many roles to bring her first project to fruition. We look forward to seeing more from this young indie film maker. Here is our interview with Stevenage’s Indie Film maker. 1: Hello and welcome to RRR’s Six Shooter interviews, please tell us a little bit about yourself and how you got the bug for making your first #Indiefilm? Great to be here! I’m Nicola Irvine and I’m 19 years old. I first started making films at the age of 12 with no production team, just making use of a little digital camera and family members as actors. I’ve always had an adoration for the horror and thriller genre as there is so much to be explored. There is plenty of bad stigma around the horror genre and I am aiming to change that by offering a narrative that gets your mind pondering. Venus has been my first production with a budget and a team, all done in our spare time so I have a very commendable cast and crew. The want to make a film like Venus had been festering for a while, so it was time to get a plan together and get stuck in! 2: How did you find your cast and how did you find the support in the Stevenage area? My cast were all found through Facebook groups like Actors UK, which give such a great response! Within minutes of posting a casting I had dozens of emails in my inbox of people wanting to apply. I’d never expected such a big response and I was thrilled with all the talent coming my way! Some people may recognise various locations around the Stevenage area including the Mr Simms Olde Sweet Shoppe which added such a great 80’s feel to the film. Many of my actors were based locally and wanted to help out on a local set to help someone in their area, which was commendable. 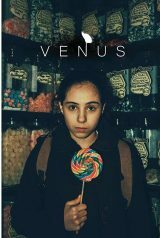 3: Venus is a dark film with quite a serious message, what gave you the inspiration to write the story? I have always been fascinated by dark tales which leave a strong moral or message in your brain. A great inspiration of mine has always been Roald Dahl, for when he isn’t writing a children’s book he can write a truly chilling tale. I wanted Venus to leave a lasting impression and convey the message that you can’t always take people at face value. The message of the film is all about trust and the shock to the audience should make them question their own actions and give them a slight shiver. 4: Which part of the filmmaking process do you like the most and which parts do you dislike the most but must do to get the film out the best it can be? My favourite part of the filmmaking process is when it all comes down to editing, because this is your opportunity to turn your script, planning and footage into something compelling to watch. I truly believe editing can make or break a film and you can change the entire tone with some edits. This being said, I think editing is also simultaneously the most frustrating part of the process also. Editing is long-winded at times because you have a set idea in your head of the tone you want to portray. Sometimes it’s not always possible to achieve the look and feel you wanted because you didn’t shoot as expected, which is constantly happening and you have to adapt and make changes. Particularly if you are a perfectionist, it’s not always easy to accept you won’t be able to achieve the idealistic image you had in your head. But that’s what makes editing very exciting, it gives you the ability to change things up to a certain point still making your cinematography and camera work on shooting days of very high importance. 5: Would you like to make film making a full-time career? I would love to one day pursue a full-time film career. I’ve always had a love for film from a very young age so it would be a childhood dream of mine. Being such a “who you know” industry to navigate in, I’ll continue to work in film in my spare time for a while whilst I get my Software degree and continue to build up my reel exploring the realm of different types of film hoping to make a feature film and documentary on my next venture. Hopefully this reel will turn into something more full-time one day. 6: Who influences you the most in life and the film industry? Jordan Peele is the most inspiring director for me at this moment. His films are all so different, compelling and almost controversial. I admire him for stepping outside of what typical audiences are guaranteed to like and make something that is his own originality and taste. Having just watched his film ‘Us’ I think he took a lot more risks than with ‘Get Out’ which had a compelling yet concise narrative. ‘Us’ took on board many plot twists and things of a symbolic nature that not everybody will understand, but it’s evident from this he has a love of film as an art form which is what a director’s drive should be in my opinion. I aim to one day, make a film as complex and compelling as his that has an audience captivated from start to finish leaving them wanting more. As well as Peele, I have always been a great fan of the works of James Wan and Leigh Whannell, particularly in their creation of ‘Saw’ upon leaving film school. They inspired me that you can be successful no matter how much experience and what budget you have. If you want something to work that badly, you will make it work.